For today's post I have a review for you, this time of The New Black Typography Weekly Journal set! But not every nail product is as awesome as we'd like it to be, and unfortunately this is one of those products that didn't fully live up to my expectations. I could just state the facts about this set and let you draw your own conclusions, but I rather give my honest thoughts about it as well. So here we go! There are 3 different Typography sets, each contains paper, transfer solution, a clear top coat and a nail polish (the color depends on the set) to create newspaper nails. My first thoughts of this set were actually pretty good, you get the paper with text that's printed backwards. With normal newspaper nails (which I did a few years ago as well) you end up with the text backwards on your nails, with this set that's not the case. 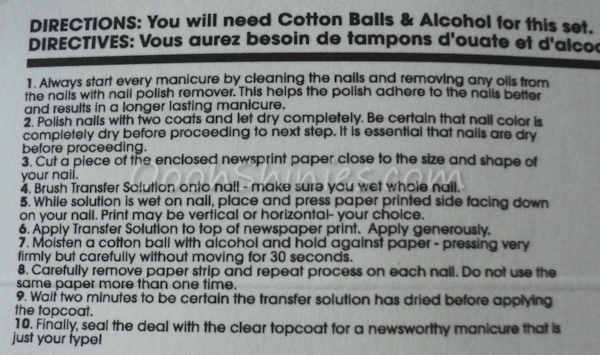 However, you can print out text yourself as well to solve that problem (there are various ways to do newspaper nails besides the original ones with just alcohol and newspaper, Nailderella shows one of those). The set comes with 10 sheets of paper, half of them have bolded text, the other half has the text in various styles. The text is made up of words like Cherish, Dream, Live, Imagine, Love, Hope, Faith, etc. which I like. When people read your nails they'll actually recognize the words instead of having random text that doesn't make much sense! The sheets are big enough to easily do all your nails with 1 of them, and with my current length (freshly filed), I think I can even do 2 full manis with 1 sheet. What I also liked was that the set has the transfer solution, which means you won't have to get alcohol, right? Wrong, as I found out after reading the inside of the package! So you still need to get alcohol, although many of you might already have a bottle lying around somewhere. But that does make me wonder what this transfer solution is! The Weekly Journal set has a light beige polish as basecolor, which covered in 2 coats. I do like the color, but as usual it's just a 4ml minibottle. I wish TNB would bring out at least come colors in full size as well! After I applied the polish and let it dry, I followed the directions on the package. The transfer solution had a hard, somewhat wonky brush, and for a moment I thought the whole bottle had dried out, but the solution itself was fine. And because the solution was so thin, it didn't matter all that much that the brush was a bit weird. I worked one nail at a time, placed the paper onto my wet nail, applied more transfer solution, and pressed down with the alcohol - all just as it said. But when I removed it, some of the paper actually got stuck on my nails! I tried to get it off, but ended up just smudging the text. The text itself did copy well and very clear, which was a big plus. Indexfinger (bold text and top coat) vs ringfinger (bold text). Both my middlefinger and ringfinger also have some paper stuck, which is most visible on the center of my middlefinger (including some smudges from me trying to remove it). My pink and middlefinger have the text in various styles. I was hoping the top coat was my fault, by not using it generously enough, so on my middlefinger I tried it again. This time with even more top coat and being extra careful to apply it floating, but it still smudged badly. For my last 2 fingers I used my standard top coat Seche Vite, and the difference is quite clear. Index (bold text, TNB top coat) - middle (various styles text, TNB top coat) - ring (bold text, SV top coat) - pinkie (various styles text, SV top coat). So all in all, this set has several downsides for me, and the last one is the price. But I do like the papers, and I do like how it can look, so I would use those again. But then I'd try using them in another way, to prevent the paper from getting stuck. I'm not sure what caused that, I applied it the same to all nails. Maybe my nails weren't fully dry afterall, but why didn't it stick to all nails then? A quick first test shows that using alcohol only transfers fine as well (without risk of getting paper stuck), using the solution makes the text show just a bit darker. I haven't experimented enough with it yet to really be able to tell the difference between using the transfer solution and alcohol / using alcohol only / using another method. But what I do know for sure, is that I'd use my own top coat straight away next time! 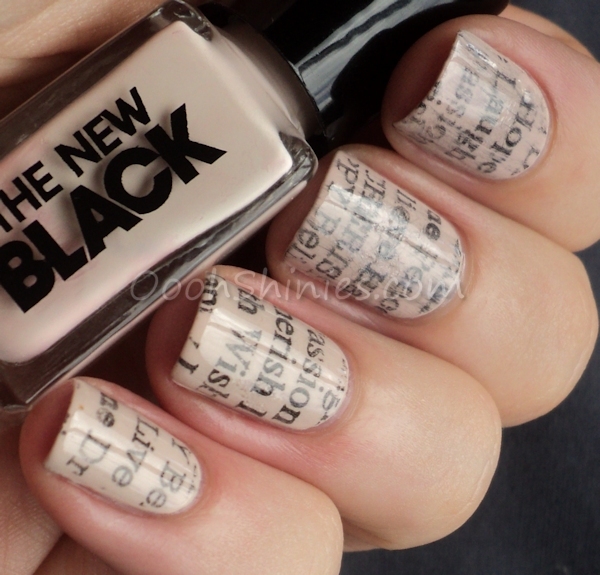 Have you tried any kind of newspaper nails? You can buy all of the sets on The New Black site, the Typography sets cost €24,95.